I love Mo and Grace, almost as much as I love Anthony and Emily Head. So, when I heard this song on his album and started thinking about what character it could go with, I had to laugh at the perfection when this Father/Daughter team came to mind. This story is their story from The Invisibles. If you haven't seen it, I highly recommend it. My first video for my king, Uther Pendragon. This is a portrait of the three great loves of his life, and the three most painful partings. A Little Bit About the Headline Awards. Originally posted by gilescandy at A Little Bit About the Headline Awards. Hello to everyone who has been following this year’s first annual Headline Awards! First, we would like to thank you for all of your support and participation. This wouldn’t have been possible without all of you. Before we post the list of winners tomorrow, I wanted to take a moment to tell you all how we did things. As you’ll recall, we asked for nominations at the beginning of the year. And you guys responded more enthusiastically than we could have ever hoped for. You brought us some of the most beautiful and interesting stories and artwork out there featuring a wide range of our beloved characters that have been brought to life by Tony Head. Then we entered the judging period. Each category had a team of judges who read and viewed all of the entries, deliberated and discussed, and came to a consensus on one winner and runner-up. And, believe me, this was not an easy task you set before them. All of the wonderful works submitted deserve to be recognized and praised. Many times our judges had to argue about nit-picky details and finally rely on their guts to come to a decision. This is the reason we allow and encourage re-entries in future years for everyone except the winners. With other judges, another work might have come out on top. So, never get discouraged. If you were nominated, it’s because someone loves your work and thinks you deserve to win! We hope to see you all back next year. After the judges made their choices, they were asked to write a comment for the winning works. This is because, as we all know, the one thing authors and artist covet above all else is comments. We hope that these comments might give you a hint as to why the winning pieces stood out for us. The final step is what we are working on as I type this. All of the winners are in and the votes have been tallied. Now we are working hard on making all of the award banners. Our artist is making sure they all get the attention they deserve. Personally, I think they are beautiful. All of the winners and awards will be posted tomorrow (2/20), in honor of Tony’s birthday! We encourage you to check out these works and give the artists and authors your own love. I would like to thank all of the volunteer judges for all of their hard work. If anyone would like to be a judge and help with next year’s awards, please message us and we would love to add you to the list. The more the better! I also need to thank the artists who made our banners and awards. Megan (pickamix) and Draco did really outstanding work for us. And finally, I might have given up on this little dream without having my two right arms with me every step of the way. Thank you Rbfvid (Restfield) and Protomeoromantic for all of the encouragement and going above and beyond the call of duty. You guys rock! Thank you all for sticking with us and we’ll be back tomorrow with the winners! Don't forget that you guys can vote for the Fan Pick awards, too! Today is the last day to cast your votes. Don't Forget! Only 2 days left to vote! Originally posted by headlineawards at 2015 Headline Awards Voting is open! Voting is open for Headline Awards Round 1 in fan-picked award categories. All judge-picked categories are completely independent from this voting. Voting ends Feb. 18th at midnight PST. If you change your mind, you can vote several times using the same email and picking different options, but every new time voting for the same category obliterates your previous votes in it. It's not necessary to vote in every category. Authors can not vote for themselves, but are free to vote for any other work in any category, including those categories where authors are nominated. Tony Head will be hosting a Live Chat for his fan tomorrow (Feb. 7th). Go to his offiical page to sign up. 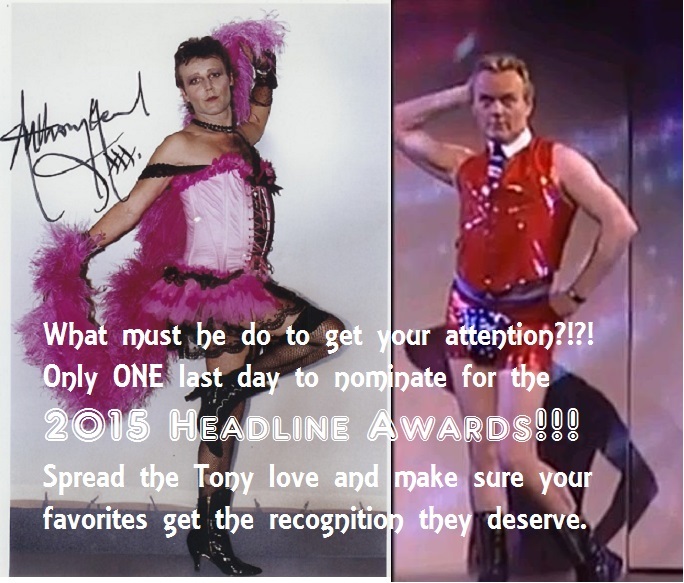 Originally posted by headlineawards at Final Day to Nominate! Nominations close Jan. 20th at the last stroke of midnight in the last time zone. Don’t miss out. 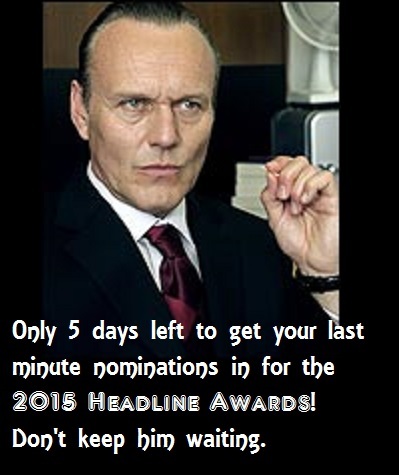 Originally posted by headlineawards at Nomination last call! Originally posted by gilescandy at We're Open! Happy New Year, and we are open! Welcome to the first annual Headline Awards. 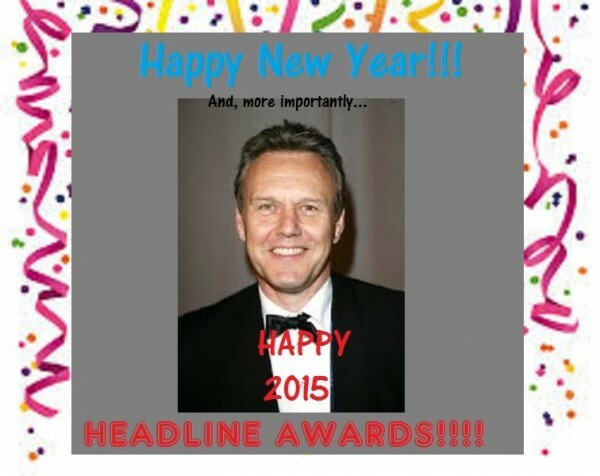 Fan awards for all things Anthony Head! If Tony played a character on stage, radio, big screen, or small screen, any fan work based on him is eligible! We can wait to see what you share with us! Nominations end Jan. 20th.